Okay – here is where the arguments end. I will not discuss using live cartridges, tape, etc. I refer to the East German Armorer’s Manual for the tools used and the values required. It is of similar content to its Soviet-era counterpart but in much better order of operations – at least in my opinion. GO gauge in the bolt. Force gauge at the center of the recoil spring hole. Smooth forward push to full battery. The maximum allowed force is 15,0 kilograms (33 pounds). There is no minimum stated force, but I think it is prudent to use 7,5 kilograms (16.5 pounds) as a minimum since that is one-half of the maximum. NO-GO gauge in the bolt. Force gauge at the center of the recoil spring hole. Attempt smooth forward push to full battery and hold at 20,0 kilograms (44 pounds). The bolt must not rotate closed and the firing pin must be protected by the hammer knock-down spur of the bolt carrier. 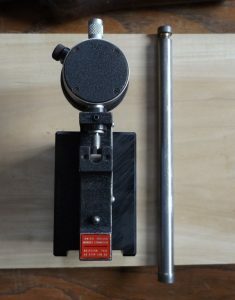 Below is the force gauge in use. The extension rod is in the recoil spring hole and the bolt carrier has been moved forward until the bolt is just starting rotation. The block is carefully moved forward until the sensing probe mates with the extension rod and the block is gently pressed forward so the assembly moves to full battery. The measurement of force is read as the bolt carrier is moving – not when it is at full battery. 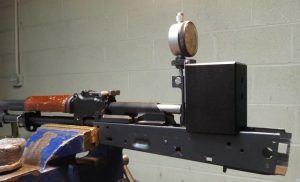 A similar measurement is done at No-Go checking where the gauge is pressed forward and held at 20 kilograms (44-pounds) force while it is determined that the bolt does not move. This is a customer assembly that will be shipped as a headspaced and pinned barrel assembly. I am using an in-house receiver so I can guide the bolt carrier. You may notice that I am clamping the assembly using only about 0-1/2″ of the receiver. If I clamp too far back (i.e. past the second rivet hole) I can accidentally squeeze the breech area so hard that I affect the headspace measurement.